Traveling in Greece? Most Greek island hoppers soon become familiar with the ports of Rafina and Piraeus, both on the Attic coast near Athens. These two ports are on opposite sides of the Attic peninsula and together they serve most of the ferry traffic out of the Athens area. Down at the tip of the Attic peninsula, low on the map, there is a little-known but useful ferry port, Lavrion. Seen as Laurion in some sources, this port offers more limited connections and schedules but still can fill in a few gaps in your travels through Greece. Lavrion is the prettiest of the three ports and feels like a small Greek island all its own. 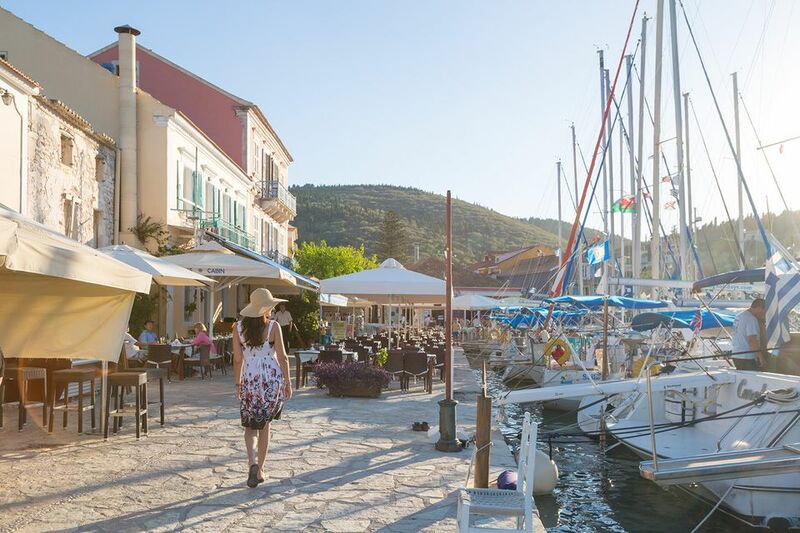 While port towns are often raced through by visitors heading elsewhere, if you do have to spend a day at a port, Lavrion may be the way to go. It has a small Archaeological Museum and an interesting Mineralogical Museum, where the local mining heritage is shown off. Just for good measure, it also boasts a giant "Mystery Hole", a geological feature which seems like a giant bubble formed at the top of a hill and then popped, leaving a two-hundred-foot deep, somewhat rounded pit. Its origins are still being debated; some believe it was the result of a meteorite impact. Though little known today, Lavrion or Laurium has an ancient history. It was the port serving the profitable silver mines in antiquity, and its protected bay was a busy one. It was also the terminus for a railway line until 1957 when the railway was shut down and attention drifted elsewhere, nearer to Athens. Its expanded and modern marine serves yachts and provides all necessary services, including berthing for large yachts. The relocation of Athens International Airport to Spata gave Lavrion a bit of a lift, since it is only about 30 minutes away, making it a closer ferry port than either Piraeus or Rafina. It's also on the way, by the route on the eastern side of Attica, to Cape Sounion. Rockhounds, mining enthusiasts, and geologists will consider the remains of the dozens of ancient mining operations worth a visit. There is also an extensive ancient theater at Thorikos, near Lavrion. The port is opposite the island of Makronissos, which in ancient times was called Helena after Helen of Troy. Later, it served as a prison island. Hotel options are limited in Lavrio; if you're looking for something more than basic accommodations, perhaps at the once-grander Hotel Belle Epoch, you may want to try the resorts near Cape Sounion. Ferry schedules will often indicate Lavrion as Lavrio or Laurio. The main daily ferry activity is between Lavrio and the lovely and mysterious island of Kea, a popular resort for Athenians and other Greek tourists, but also hosting a few hotels and some expatriates. The local Goutos Lines operates the Marina Express ferry on this route, which also serves the Greek island of Kythnos. If you are planning ahead, remember that Greek ferry schedules are usually not posted until they begin, so a route starting March first may not be listed until after March first, making advance planning tricky. They will usually not be available for online booking until that schedule has started. The absence of a ferry listing does not necessarily mean that there will be no ferry for the timeframe you need. A call to either the ferry line itself or to the port authorities will get you the information you need. The Lavrion port authority number is (011 30) 22920 25249.